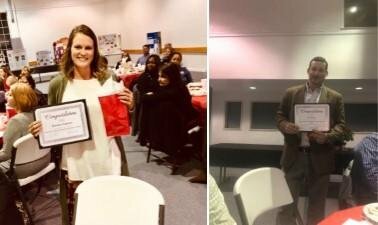 MCHS English Teacher, Mrs. Kristina Cannon, was awarded the Newberry County Reading Council's Distinguished Literacy High School Teacher of the Year Award at the Reading Council Banquet on Tuesday, November 13. Assistant Principal, Mr. Zeb Reid, was awarded the Newberry County Reading Council's Distinguished Literacy Administrator of the Year Award. Congratulations Mrs. Cannon and Mr. Reid.